I walked in the suburbs, far from home and without coat or umbrella, and there came a cloudburst. Across the road was a bus shelter – one of those enclosed on nearly all sides – and I dived inside to escape the falling water. There was no one else there – and so to a post that might have been entitled 10 Minutes in a Bus Shelter. Well, you know, I was standing there, with interesting things to look at all around – the misty windows, the gleaming streets outside, the patterns on the floor, the metal struts framing the translucent perspex, the bright red seat, you name it – and I had a camera burning a hole in my pocket. That’s one thing about photography really, if you get right into it, nowhere is visually boring, there are always things to stare at – and in this case, unless I fancied a drenching, I had the leisure to stare. So, what to stare at? Two worlds. First, the confined, almost claustrophobic world of the shelter, distorted slightly by the TG-5’s wide lens – misted windows, patterned floor and red seating: bland, functional modernity, purposely designed for the have’s in our society who catch the buses, and equally purposely designed to offer little comfort for the have-not’s who have nowhere else to go and would like somewhere other than the shelter’s cold floor to sleep on. And here we all were, at the start of November, gearing up for The Season of Goodwill. But then, the bus shelter is in the real world, whereas The Season of Goodwill is only in our minds. And the second world, the outside world, the view out through the shelter’s ever-open doorway: a view to wet pavements, a passing car and, in the background, an equally passing factory. But, you say, how can a factory possibly be passing? Well, I’m a geologist and to me everything is passing, but it is apparently the case that this old factory is on a site earmarked for hundreds of new houses; we shall see. So I loitered there, looking at anything and everything, taking it all in. And two women passed, better equipped for the weather than I. And, whispering together, they gave me a long, suspicious look. I imagined their conversation: “Here, what’s that strange old man doing in that bus shelter? Do you think he’s a prevert?” (she’d been watching a Dr Strangelove rerun). “Well, I expect he’d say its artistic, but I’m not so sure …”. Actually I’ve got that quote wrong, because the most used words in our new, Politically Correct society are appropriate and inappropriate, and I have a feeling that, in their eyes, I’d have merited the latter. But, nobody expects the unexpected, I do think. And, as Bob Dylan might put it, “”You can be in my bus shelter if I can be in your’s …” . The first image in the Outer Suburbs series, with context, is here: 1 . Subsequent images are here: 2 3 4 5 6 7 8 9 10 11 12 13 14 15 16 17 18 19 20 21 22 23 24 25 26 27 28 29 30 31 32 33 34 35 36 37 38 39 40 41 42 43 44 45 46 47 48 49 50 51 52 53 54 53a 55 56 57 58 59 60 . Each will open in a separate window. Technique: TG-5 at 25mm (equiv); 800 ISO; Lightroom, using the Camera Vivid film simulation; south Bristol; 1 Nov 2018. But yes, to find something interesting in the everyday is to be admired. A heads up regarding Don McCullin: he is featured in a documentary next Monday on the BBC (can’t remember which channel) commenting on England and what a mess we’re in. He’s also featured in an article on the Guardian Online today – I haven’t read it yet. Just the right moment! I like your description of it very much too. 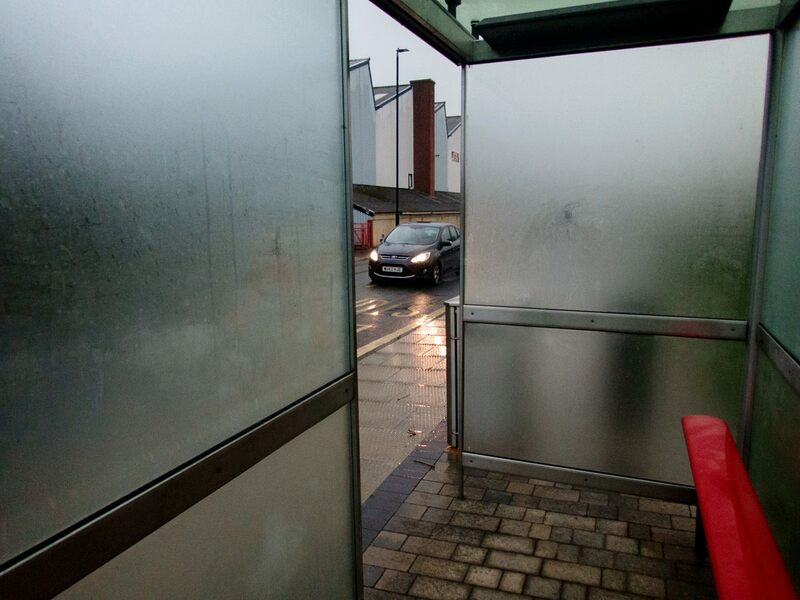 So many interesting things to see inside a bus shelter, while most people would have just been annoyed and retreated into worries or the phone screen – that other world. All the grays and various angles are beautifully composed here. Yes, always best not to retreat into “that other world” and – when relaxing in a favourite (and undeniably tattered) old armchair – a glass of the Electric Soup can provide many benisons too, tho I’ve found that the ideas I come up with and the images I capture whilst in that state of exaltation can be at best unusual, and at worst embarrassing … 😦 …. Dived right in there, huh? As Kipling once write: “You’re a better man than I am, Gunga Din. “ Haha. My diving days are over. Lots of opportunities here, I see. The touch of red adds interest to an already interesting shot. Enjoy the weekend, my friend. Yes, though never having learned to swim, I’ve done quite a lot of diving in in my time; getting a little more sensible now, which may be a shame, but the old instincts haven’t gone anywhere. 😉 I’m glad you like the image; I enjoyed creating this post. You enjoy the weekend too, I hope you’re both just fine and dandy, as they say Down South!!! I see that one of the possible contenders in the presidential race is a Hindu woman, which is very good to see. ATP xxxXXX!!! Yes good to see. All I want is someone that knows what they’re doing, cares about the country, and can string two COHERENT sentences together. Too much to ask? A very interesting image, wrapped up in a nice tale. Can’t ask for more than that. Brilliant to be able to make something out of so little. Very good, love the red seat and the composition.